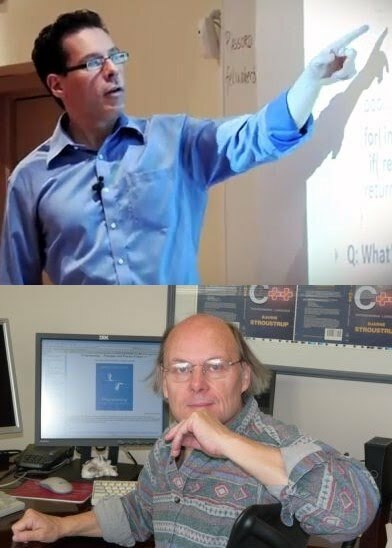 For our September meeting, we will be joining the Chicago C/C++ Users Group for a presentation from two leading members of the C++ Standards Committee, Herb Sutter and Bjarne Stroustrup. Each presentation is self-contained, but you will probably want to attend both. Please note the special time & location. Herb is a consultant and trainer, has served for a decade as chair of the ISO C++ standards committee, and is a software architect at Microsoft where he has been the lead designer of C++/CLI, C++/CX, C++ AMP, and other technologies. Herb will be speaking on updates on modern C++ techniques and style, the latest standardization news from the committee meeting that will be in town and in progress this same week, and the mystery title topic. If you’re interested in today’s modern C++, you won’t want to miss it. Bjarne Stroustrup is the man who single-handedly invented the C++ programming language, back in the mid-1980's when he was working at Bell Labs. He now teaches at Texas A&M University. Our description of his talk is short and tantalizing. This is what he has told us: "I'll be giving a broad-spectrum C++/C++14 talk." Whatever that's going to be, it will certainly be worth hearing. Please note that we will be meeting in the Renaissance Hotel, and, due to hotel regulations, no outside food or drink may be brought into the meeting room; so you may want to have dinner before coming to the meeting.